Next post: PHOTO OF THE DAY: Where’s the adult-free zone? Flight attendant details life in the sky in best-selling book by Brian Summers originally appeared in the Daily Breeze on August 6, 2013. Heather Poole will not soon forget the underwear incident. It was three years ago, when a New York Times photographer visited her home. Poole is a flight attendant, and the newspaper’s website published 12 pictures detailing every step of how Poole packed for a week-and-a-half trip. One tip: Poole prefers rolling some clothing rather than folding to save space. There was only one problem: She didn’t pack any underwear. And people — lots of them — noticed. So eventually, she came clean on her blog. Such is life for Poole, a Redondo Beach resident who might be the most famous flight attendant in the United States. 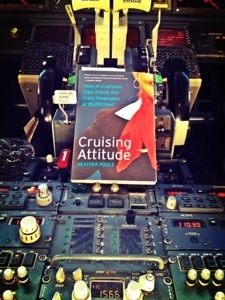 Her 2012 book, “Cruising Attitude: Tales of Crashpads, Crew Drama and Crazy Passengers at 35,000 Feet,” was a New York Times best-seller. While still working for a major airline, she has appeared on ABC’s “20/20” and “Good Morning America,” as well as “The Ricki Lake Show.” She has almost 90,000 Twitter followers, and her blog is among the most popular in the industry. The recipe for her success is simple. Poole, 42, engages with readers about flight attendant life — layover hotels, seemingly endless shuttle bus rides, cranky passengers and canceled flights. She shares how she can never plan for holidays like Thanksgiving or Christmas because she rarely knows her schedule in advance. Heather Poole is fond of telling how she met her husband, Neil, on an airplane and how he told her, in the aircraft’s galley, that she could do better than the men she was dating. As I sit here in CLT, moaning and groaning about a connection that, if I’m honest with myself, is never going to come (It’s three hours late), am roused from my grumpiness by the hilarity of the “underwear incident”! This book is simply great. As a flight attendant myself, it deeply excited and moved me. Highly recommended!